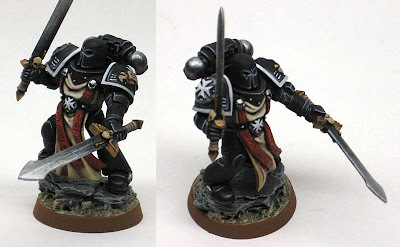 As part of my current commission, I was asked to finish a few more Black Templars to fill out my friend's Black Templar force. 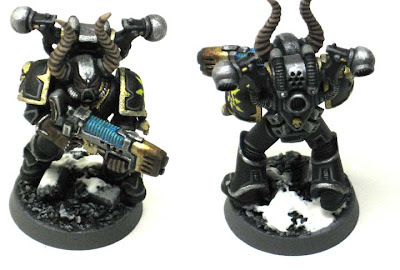 Above are the regular troops and below is the Emperor's Champion. 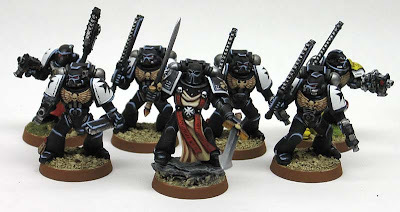 Since this post is fairly old, I've decided to add a few more links to it to expand on painting black armour. An awesome looking bunch, I love the detailing, the recipitent will be very pleased I'm sure! That is a really sharp looking Emperor's Champion - I like it a lot. Keep up the great work! Great job, can I ask how you did the red on the emperor's champion? Only crisism is that the poses aren't that varied as most of them are holding up their chainsword with their right hand, although there isn't always anything you can do about that. I think I'm going to quit painting things myself and hire you as my full time painter. How does that sound? Thanks guys, they were easy enough to do... they're black so it's really a matter of highlighting and details. Oni: I'm always looking for more work. Good prces, fast turn around... have your people call my people. Peter: I know what you're saying about the pose, I realized they were all very close when I took the picture. It's hard when there's only one arm with the chainsword. They kind of look like they're dancing when you look at them like this. On the tabletop though, you'll never notice. The red is simple, basecoat with any opaque red, devlan mud wash, go back over with the base coat and then find a lighter red and do a few highlihgts (preferably a transparent red this time around). I really like this. Great job and the helmets look nice! Love the champion - looks amazing, really creates some personality for a templars force. Let me add congrats. You have a real eye for style. Just one question: did you intentionally leave out the typical "space marine helmet lenses" on the champion? Marcus: The models are part of a commission, so they can to me already assembled. But to answer your question, yes. I left the "lenses" out of the Champion's helmet because I wanted it to look different and painting them like th eregular helpmet lenses just didn't seem to fit or be the correct way to paint them. This gives him the look of having an old, traditional helmet without all the fancy electronics and junk like the new guys have to have. Extremely nice looking models there, look great from a distance - although the highlights look a little harsh when blown up, which is understandable. The Emperors Champion is excellent all over.